We’re working from the outside in on this one, folks. You may recall that Brian Kinsley offered a thorough examination of Joe Penhall’s “The Road” screenplay for this column back in September last year, which already addressed many of the challenges inherent in this particular adaptation. However, in keeping with Page to Screen’s return to discussing source material rather than scripts – and with John Hillcoat’s film on a lot of people’s minds this week – I thought it a good time to take another look at Cormac McCarthy’s much-garlanded novel. I should specify that I have neither read Penhall’s adaptation nor seen the film; the novel is the only text with which I am engaging at this point. It seems only fair to start with a blunt, and admittedly very guilty, confession: I don’t very much like McCarthy’s novel. Before the irate attack begins, let me clarify that this statement is not in any intended as a challenge to “The Road’s” literary worth, much less its potential for successful filmmaking. It is, in its paradoxical construction of loose, virtual shaggy-dog-style narrative and terse, urgent prose, an indisputably awe-inspiring novel, one that at once gazes into the back-to-back mirrors of who we are and who we will be, and arrives at some discomfitingly vivid prophecies in the process. 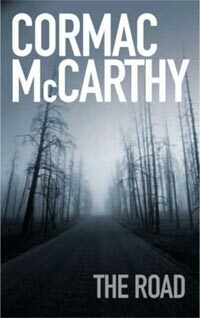 I commend McCarthy’s avoidance of didacticism and rationalisation: the novel’s grim, apocalyptic future is presented as a terrifying inevitability rather than a cautionary allegory, offering no concrete indication of what led humanity to the long-desecrated point at which the narrative begins. That may not make the novel as ideologically constructive as the kind of “it takes a village” finger-pointing that colors so many other literary and cinematic warnings of man’s imminent self-destruction – the film, when it finally arrives, would surely make for an interesting double-feature with Andrew Stanton’s “WALL-E” – but it is certainly a much more jolting, unnerving experience for it. All marvelous achievements on McCarthy’s part, but for all its impeccable mastering of stop-and-go tension and mesmerizing atmospherics, it’s not a novel that makes me feel a great deal. I know a number of grown men who have been reduced to tears by the primal love that drives the embattled father and son who become our sole human touchstone in this unrelenting world of ash and rot, but I struggle to empathise with two characters whose every personal idiosyncrasy has, by necessity, been subsumed by their survival instincts. It’s my failing, not the novel’s, that I cannot see even a refracted version of myself in the duo, but it remains a key emotional barrier to me nonetheless. Structurally, moreover, McCarthy’s narrative couldn’t be any more elemental and precisely goal-oriented for a traditional screenwriter’s liking. A journey narrative in the most literal sense, it imposes upon its character a fixed destination and a clear set of restrictions and deadlines that define and challenge their progress: just as McCarthy’s “No Country for Old Men” presented itself to cinema, “The Road” is a desperate, razor-taut thriller that pits good against overwhelming evil, but then never finds closure, ending with the world still subversively out of balance. If its tonal levelness and repetitive rhythms seem antithetical to conventional film narrative, its only because it hands its protagonists an unending series of obstacles, rather than isolating key challenges as act markers. As a heroic quest narrative, even a tragic one, “The Road” is doomed to failure; as an art film, one that is willing to magnify the everyday struggles of the lives at stake, it ought to work just fine. Even meditative mood pieces like this one, however, need penetrable characterisations to remain compelling, and I’m interested to see how the film externalises two intensely guarded characters who have learned to ration their words as judiciously as they do their food. There has been back-and-forth talk of a employing voice-over as an emotional inroad, which might be seen in some quarters as sullying the minimalism of McCarthy’s dialogue, though I wouldn’t necessarily dismiss the idea: as Kubrick (a director who repeatedly comes to mind as a reference point for this material) proved, voice-over needn’t equal overt intimacy, but it can, even in third person, track thought processes, something I personally struggle to consistently locate in the novel beyond the characters’ core motivation. Of course, it may not be necessary. In Viggo Mortensen, Hillcoat is working with one of the current cinema’s great quiet everymen, and if anyone can make the novel’s stolid, unnamed hero empathic and emotionally alive on screen whilst remaining loyal to the novel’s aesthetic minimalism, it’s this immensely physical, restrained performer. It’s a masterstroke of casting that I hope connects with its on-paper potential: if it does, I can see Mortensen leading the film’s awards trail. With no acquaintance of co-lead Kodi Smit-McPhee, I can hardly offer similar speculation, though I must once more take a minority stance in finding the characterisation of the boy in the novel symbolically resonant but dramatically thin. As for the reportedly expanded role of the boy’s deceased mother, the novel affords her one of its most emotionally expressive scenes, which I expect Charlize Theron to take blistering advantage of, though as in the novel, I think she would arguably retain more impact as a remembered but invisible presence. Indeed, with the novel as my compass, I’m hesitant on awards prospects for the film – and not because it isn’t an extraordinary piece of work that I expect will make a striking film. (Early word fulfils such expectation, after all.) It certainly offers any number of exciting technical possibilities, while the immense literary cache and state-of-the-nation relevance of the source material might make it seem awards-friendly (two advantages the similarly dystopian adaptation “Children of Men” didn’t have). But while 300 pages of unyielding despair can be consumed at a reader’s own will and pace, I wonder how eager an audience there will be for an uninterrupted two-hour visualization that (hopefully) doesn’t dilute the nightmarish quality of McCarthy’s prose? It may sound like a perverse thing to say, but if they get “The Road” right, it shouldn’t be an Oscar movie. Not on paper, at least. Coincidentally, the trailer is not available on Yahoo! Movies. I was very ignorant when I read it. I kept waiting for something to really happen or a goal to be reached. God knows how naive I was and had to re-evaluate the whole thing afterwards. Brilliant perhaps but not my cup of tea. Guy, the trailer does not look as bleak as the book seems to be. How does the look of the movie correspond to the atmosphere of the book? There were also some typical disaster movie CGI shots thrown into the trailer. Atleast from the trailer, it seems they will be trying to sell this like a post-apocalyptic actioner, not exactly Terminator Salvation or I Am Legend , but something along those lines. I must agree with you on your assessment of the book. My immediate thought after reading it was, “Well that wasn’t great but it’d sure make a nice film.” Needless to say I eagerly await it.